Likewise ISIS- and al-Qaida-linked groups in Africa prosper by trafficking drugs across the Sahara and by offering “protection” to smugglers who have long been trading illicit goods throughout the continent. Although Westerners tend to think of these groups as driven by ideology, new recruits may be more attracted by opportunities to make money. The market for narcotic substances is growing substantially within Africa itself. Until recently, the majority of powerful drugs in Africa passed through only on their way to Europe and North America. 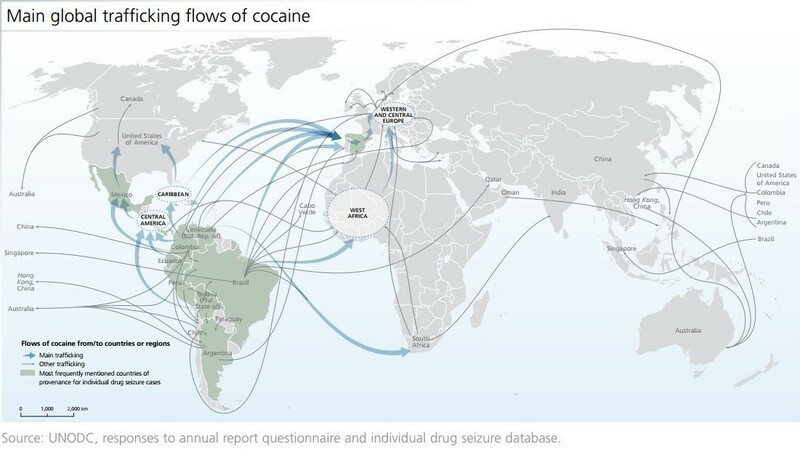 West Africa, for example, provides a convenient shortcut and stopover point for cocaine destined for markets in Europe. East Africa sends Asian heroin to both to Europe and North America. Hashish may be locally grown in Africa, but large quantities end up in Europe along with khat, a favorite of the Somali community. Too few social scientists have studied narcotics trafficking, particularly how drug profiteering influences and fuels terror and radical insurgent movements. My work on failed states , governance and civil conflict leads naturally to a consideration of such associations and relationships. In my view, understanding how plunder makes terror possible is fundamental to understanding how some nonstate actors are more mercenaries than servants of a cause. Defeating ISIS, al-Qaida and their offshoots will, in other words, depend more on cutting off their riches than countering their appeal to wide-eyed would-be fundamentalists. Various big-power intelligence services are looking into how the drug trade works in Africa, and the interconnections of drug routes and militancy. The most comprehensive work is being done by the U.S. Drug Enforcement Agency (DEA), which has agents in Africa and issues pointed reports about the trade. Nevertheless, given the clandestine nature of narcotics and trafficking, conjecture and speculation abound. With big money at stake, operatives have every reason to cover their tracks. Thanks to research done by the Strategic Studies Institute at the Army War College, we do know that cocaine arrives in Africa from South America on an almost daily basis. Stemming from growers in Peru and Colombia, some cocaine leaves Venezuela and Brazil by private jet aircraft bound for secret airfields in Guinea-Bissau. This small West African nation is widely regarded as Africa’s primary narco-state. In recent years, military coups and other forced changes in Guinea-Bissau’s weak government have directly reflected competition for control of drug-fueled profits. Other loads of cocaine from Colombia arrive at proper international airports in Nigeria, Benin and Ghana , hidden in shipments of plantains or coffee. Corrupt airport officials and customs and police officers make sure that the valuable shipments are soon on their way by air or road to Europe. The fact is that today about 40 percent of the cocaine that reaches Europe annually comes via Africa . That is where al-Qaida in the Islamic Maghreb (AQIM), or several of the Islamist groups that have been active in raiding and destabilizing Mali , Mauritania , Niger and Burkina Faso , muscle into the picture. They want their cut of the profits, either from being the major transporters of cocaine across the Sahara to Europe or from facilitating that traffic for a sizable slice of the returns. The competing groups battle, as they have for the past two years in Mali, for primacy and control. That competition also leads to the macho assertion of prowess, as in the raids on Timbuktu and, in January, in Ouagadougou , the capital of Burkino Faso. Innocent bystanders lose their lives when the drug runners randomly invade hotels to boost their power and standing. Additionally, development suffers when drug traffickers threaten fragile governments. Most analysts are unsure of the extent to which Boko Haram, the homegrown, now ISIS-tied, Islamist rebel movement in northeastern Nigeria and neighboring Cameroon, Chad and Niger, traffics in narcotics as well as uses them. What is clear is that Boko Haram guards one of the traditional long-distance trading routes northward to the Mediterranean. It also requires cash to purchase what guns and ammunition it can’t obtained by overpowering the Nigerian military or raiding its barracks. The suspicion, therefore, is that Boko Haram, having killed thousands, kidnapped hundreds and destroyed 70 or so villages, fuels its growth and pays its new recruits from proceeds derived from the drug trade. On the other side of the continent, Asian-refined heroin derived from Afghan or Burmese poppy seeds flows by dhow sailing vessel and by air into Ethiopia, Kenya and Tanzania. There it is redirected to Europe, and sometimes, via Nigeria, to Mexico and North America. Al-Shabaab, the Islamist, al-Qaida-affiliated terror movement of Somalia, derives much of its predatory income from the movement of Asian heroin and locally produced qat. Seleka, the Muslim insurgent group that captured and fractured the Central African Republic before being ousted by French and other militias, made money from transshipping drugs from south to north. Lebanon’s Hezbollah , which has always had side operations in West Africa among the Lebanese diaspora, also profits from narcotics dealings on the periphery of the Sahara. Whether al-Shabaab, or any of the other al-Qaida- and ISIS-associated movements in Africa, would continue to constitute serious threats to local and world order absent abundant incomes derived from smuggling drugs and other goods like charcoal and hashish is not known with any certainty. But, certainly, drug profiteering is an opportunistic pursuit that drives terror activities. Interventions by French and local forces, backed by the United States and Britain, have made drug trafficking more costly in Africa. They have also threatened the rent-seeking from which the various Islamist insurgent groups derive steady incomes by controlling drug movements through ports and cities such as Kismayu and Merca in Somalia and Timbuktu and Gao in Mali. The U.S. and its allies also provide security for local administrations in beleaguered places like Somalia, Mali and Niger, thus countering the insurgents. But another, longer-term, way of depriving the terror groups of their cash and their influence is by legalizing the cocaine and heroin market in Europe. Former U.N. Secretary General Kofi Annan’s Global Commission on Drug Policy is battling to have that obvious decriminalization proposal taken seriously, but so far with little result. His proposal, if adopted, would reduce consumer prices, make the product taxable and eliminate much of the incentive to ship narcotics clandestinely. In short, it would undercut terror movements. But, so far, there is no U.N. or national support for his sensible, albeit controversial, proposal. Combating terror in Africa, at least, now depends as much on cutting off insurgents from their sources of income as it does on defeating them on the battlefield – a much longer, tougher and more costly pursuit.